The Irix is a manual focus, electronic aperture prime lens. Irix is a relatively new name in the industry, but my impression is that they aim to fill a niche of high quality wide angle primes at low prices. The build quality is indeed very nice. Focusing is smooth and the lens seems like something that will not break or die anytime soon. The lens is not exactly tiny, but considering the 11mm view, the size and weight are not obnoxious. It seems slightly smaller and lighter than my Nikon 14-24 2.8. Waterfall on the shores of Lake Superior. Irix 11mm at f/16, 1 second. In this case 11mm was really helpful, as the clouds were arcing high overhead, and the prominent foreground ridges lended themselves well to the wide view, adding lots of depth to the scene. I was probably less than 10 feet from the waterfall! There are a lot of nice touches to this lens. One I love in particular was the addition of a click stop on infinity focus- something I hope manufacturers add to EVERY lens from now on. (And, infinity IS actually infinity, at least on my copy!) Another cool feature is the rear gelatin filter slot. This lets you put tiny resin ND filters behind the lens without any sort of holder on the front of the lens. The design is pretty good, I added/removed filters in the field without problems, although I would not want to attempt it in inclement weather or dusty conditions. The gelatin filters come in a pack of 15, and it works out to about $1 per filter. The only downside to these filters is that they are not realistically reusable, at least not if you are a big clumsy oaf like myself. (Removing them, I would almost always get fingerprints on the filter, etc.) There are third party filter holders for this lens on the market, but they are about $500 for the holder and $500 for each 180mm glass filter, so I think I will stick with the gelatins for now! Flare seems well controlled, this is a single shot with no flare spots removed. Be aware the sun can be well out of your frame and still create flare spots in a lens this wide. Optical quality and sharpness at f11-f16 holds up well compared to my normal ultrawide- the Nikon 14-24mm. Unfortunately, I didn’t have a chance to try any night/low light shooting with it, so I can’t say how well it performs at f4 (max aperture) just yet. Suffice it to say that I am pleased, and have not had any sharpness issues on a high resolution body (D850). On a side note, I also threw it on an infrared converted DX body, and it seemed to work well. Distortion seems controlled. 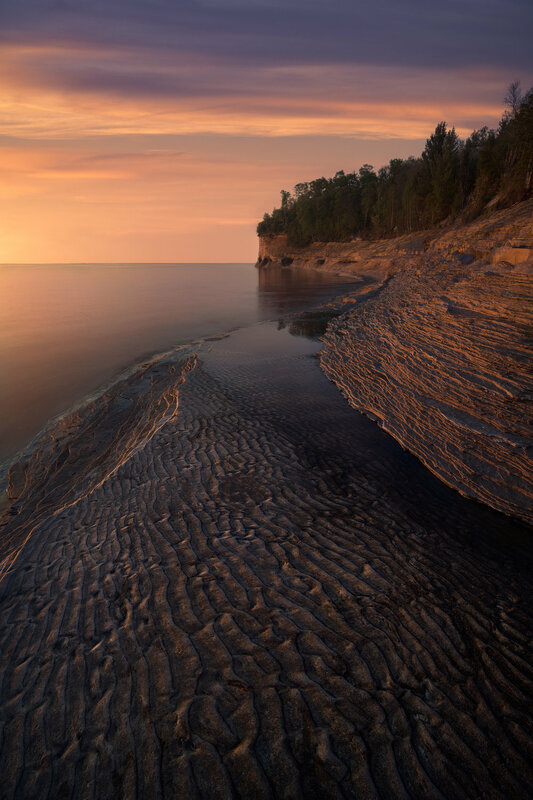 I had no issues shooting at the Great Lakes, where straight horizons quickly reveal typical distortion issues. Stormy spring weather on a walk near my home with the family. The ultrawide 11mm perspective lends itself well to creating depth out of any repeating patterns. So, a quality lens with a good price, and a focal length previously unreachable to Nikonians. Pretty much a no brainer for me! Keep in mind I am a manual focus guy with wide angle work. If you are an autofocus junkie you might not like the manual focus. There are a few peculiarities that I would also like to bring up regarding shooting at 11mm, for those on the fence about buying a lens this wide. These points aren’t really specific to the lens, instead general observations about the practicalities of shooting at 11mm in the field. 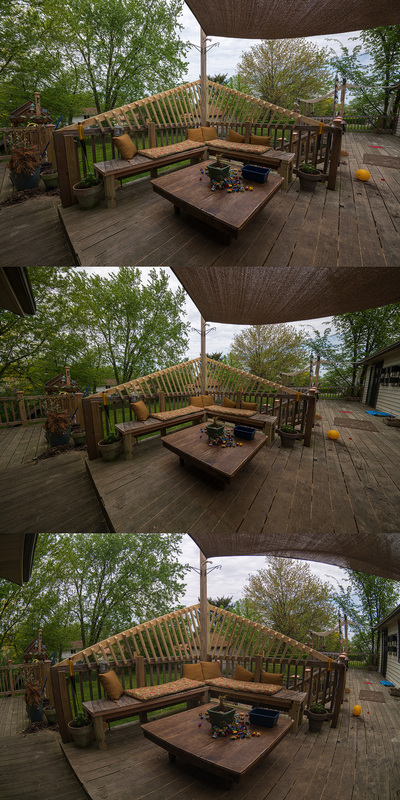 Some test shots on our back deck. Top to bottom- 14mm, 11mm, 16mm fisheye. You can see the Irix is just about as wide as the fisheye without the distortion! The good is that all the things a normal ultrawide excels at- adding depth to tight spaces, capturing lots of sky for night work or storm chasing, near/far foreground progressions- this lens knocks that stuff out of the park easily! I’m confident there are places at the base of many well known waterfalls that were unshootable before, that this lens could capture- simply because you can fit so much more in the frame. The bad- 11mm is so freaking wide it is comical. Shooting with it requires some careful thought and composition. All the things that are wonky on a 14mm- distortion, leaning trees, etc are magnified intensely. In the forest you can pretty much forget about tilting your camera up or down at all, unless you like crazily leaning trees in every direction. As with all ultrawides, it also smashes whatever is center frame wayyyyy into the distance, so you will need an EXTREMELY prominent subject to stand out. Even towering peaks can look shrimpy in this lens. On a similar note, the foreground is so wide that you need not only a good patch of flowers/mud cracks/etc, but a very LARGE foreground area, or you will end up with huge empty zones in your image. Bokeh at 11mm? It does exist, although the practicality is questionable. Still, a fun lens to chase kids and friends around with. Here grubby kid hands are just about touching the lens. All that being said, I’m glad I added it to my bag, and look forward to playing with it in the future. It isn’t going to be my first choice in many situations, but when it is needed it performs admirably, and can do things no other Nikon lens can do!